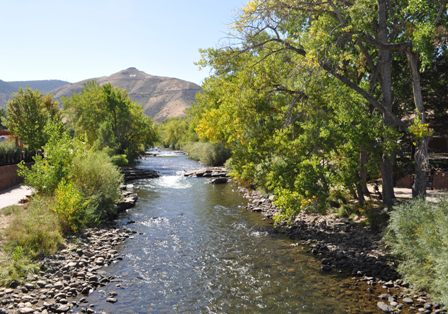 There are simple changes we can make in our everyday lives to keep pollutants out of the stormwater and protect the health of our environment and the Boise River. Together we can make a difference. Dispose of dirty carpet cleaning solution down a sink or indoor drain. Clean latex paint supplies in an indoor sink, not in the street. Pick up after your pet, bag it, and dispose in the garbage. Sweep driveway and sidewalks instead of hosing debris into street or storm drain. Dispose of debris in trash. Use less toxic ways to control weeds. Hand pull or dig weeds instead of using herbicides. Empty pool or spa water onto landscaped area when chlorine residual is zero. Use sawdust, cat litter or other absorbent material to soak up automotive fluid drips or spills. Sweep debris and dispose in the garbage. Wash car on lawn or use commercial car wash to prevent soap from entering the storm drain. Take advantage of Household Hazardous Waste Mobile Collection sites near you. Learn waste types and disposal solutions, recycle.